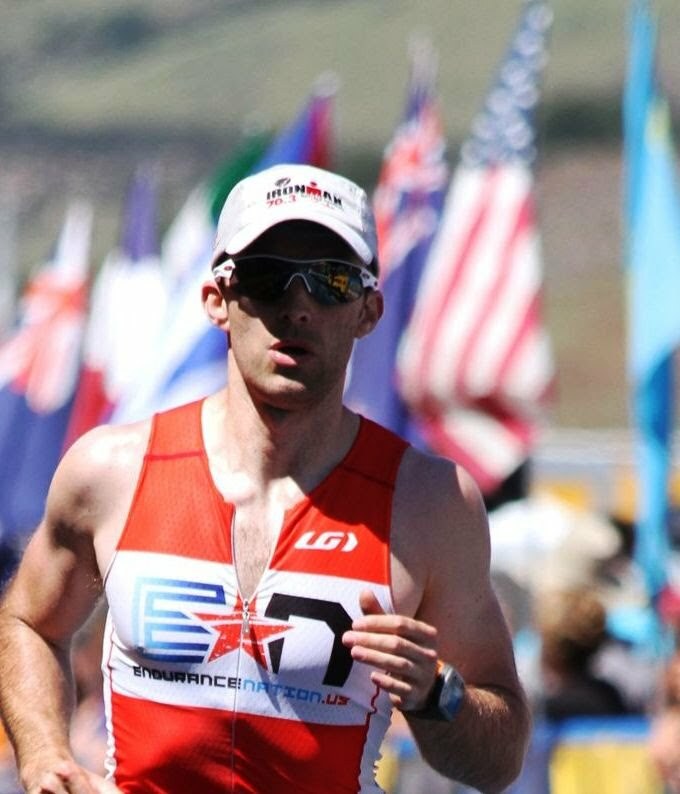 Endurance Nation has 17 folks racing at Canada this Sunday. All we have to say is Penticton is about to get a lesson in EN Ninja Race Execution! Will be a blast to watch. I’m Jenn Edwards and Canada will be my second Ironman® and my second Canada in a row! I got into the sport in 2006 when a friend of mine asked me to do a “Tri-It” class. Soon enough my hubby Mark was on board and that summer we all finished our first sprint. Since then I’ve made the triathlon lifestyle change, lost 80 pounds and continue to improve my performance. In fact, my top secret plan is to improve until I’m the only one left in my age group and they HAVE to send me to Kona. I like Canada because it’s within driving distance and Mark (Cap’n Mark, officially) is able to participate as a swim course marshal with our boat – he’s getting pretty good at pulling out green-faced swimmers! At Canada I’m hoping to execute like a ninja! Photo: My “Cowbell Crew” of supporters and me after the finish of Canada 2010. They had cowbelling blisters! Murrieta, CA. This will be IM #25. I have done Canada 5 times but not since 1999 when I signed up in June. How times have changed. I am looking to survive the scrum known as the swim. I will start off slow on the bike and taper from there. I hope to gain some energy from the wonderful crowds along the course and volunteers. My One Thing will be to get my nutrition down and keep it down so that I can have a strong second half of the run. I will be accompanied by my Iron Sherpa Extraordinaire, Brenda, my wife. 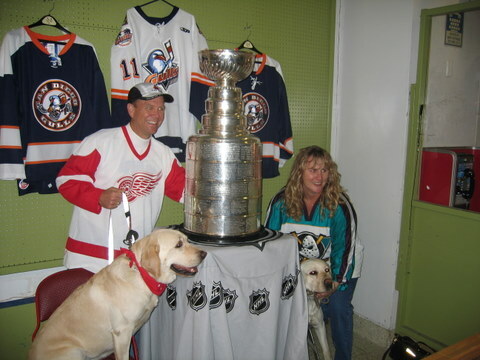 My attached photo is Brenda and me along with our dogs with the Stanley Cup. I figure it will give me some good mojo in addition to the Team En mojo that will be split between IM Lou and IMC!! My name is Brendan Shannon and I am a 26 year old from Pasadena, CA. I have done four halfs (Wildflowex2, Vineman, Lubbock). Canada will be my first IM. After a bad crash last season that left me with a broken scapula (yes, scapula) , It was great to recover fully and be back on the trial of miles… Im looking forward to meeting some fellow ENers in Canada and putting the EN tools into full effect. 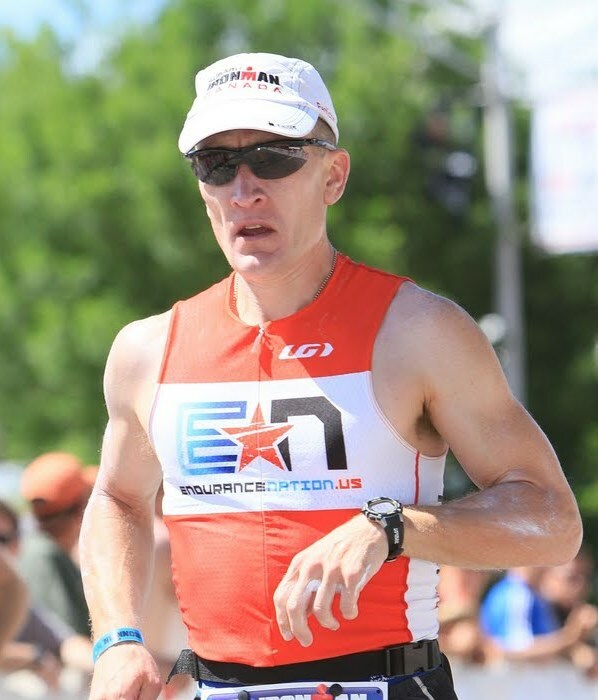 I’m Mike Bland, and I am from Lenexa, Kansas (just outside of Kansas City) and looking forward to racing Canada again in 2011. 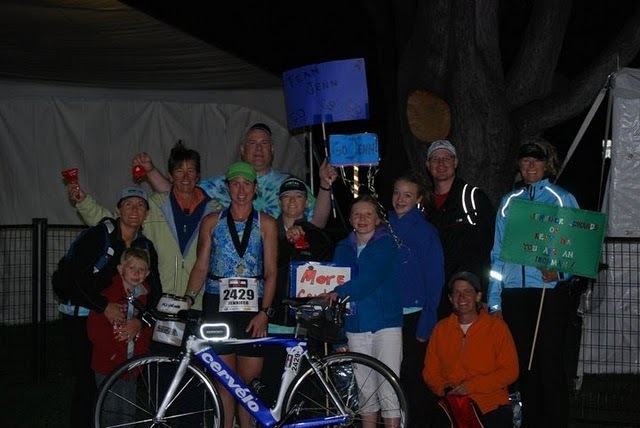 This will be my 7th Ironman® race and the only race I have done twice. I raced Lake Placid earlier this year, and it’s the first year for doing 2 IM races as well, so I am hoping the 2nd race goes as well as the first. I have 1 daughter, Alyssa, who will be 13 this year. Racing started for me with marathons when I turned 30 as kind of a mid-life crisis and an activity to reduce some weight from my job at the time. I have just kept on adding on races ever since. This year I turn 40 and will celebrate 10 years of doing endurace racing – amazing that it’s been that long already. Later this year, I will attempt a 100 mile trail race, so the fun just keeps on going ! Found EN this year and was very glad that I had a PR in Lake Placid by 13 minutes. See everyone in Penticton ! 9 years of racing tris….finally getting competitive.